One of the best thing I have experienced as a reviewer for Stacie is the opportunity to get to know new authors and read some amazing books. I had never heard of Josi Kilpack before I became a reviewer and now I think I am one of her biggest fans! When Josi gave me the opportunity to read and review her novel, English Trifle, I was really excited! I’ve been to England numerous times and I’m a huge fan of English culture and English food; for these reasons, the idea of reading Kilpack’s book that is set in England really appealed to me! English Trifle is the second book in a series of mysteries that centre on Sadie Hoffmiller (you can read my review of Lemon Tart, the first book in this series, andDevil’s Food Cake, the third book in this series). In English Trifle, Sadie has gone on a trip to England with her daughter. Her daughter’s boyfriend has been called back to England because his father is really ill. His father is an Earl and, as such, his son has to decide if he will stay in England to assume the role of an Earl if his father passes away or if he will return to his life in the United States. Sadie and her daughter, at the Earl’s home, find the Earl’s caretaker dead. A whirlwind of activity takes place and the body disappears! Sadie finds herself immersed in a number of mysteries as she tries to figure out where the body has gone, why the caretaker was murdered and why the cousin of her daughter’s boyfriend is trying to get her out of the country as fast as possible as she begans to seek answers. I loved this book because there were twists and turns around every corner in the story! I know very little about how the title of Earl is passed on through families in English society and I found that Kilpack did a great job of explaining family titles (which are quite confusing!) in an interesting manner within the story. I also loved all of the realistic British touches in terms of dialogue and English cuisine! I also found the recipes really appealing – I can’t wait to make my own English Trifle from the recipe included in the novel and I’d love to try making the recipe for scones! 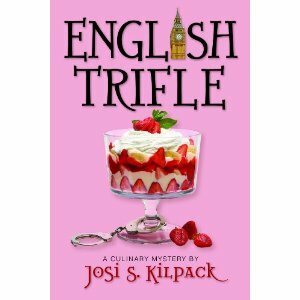 Of all the Sadie Hoffmiller novels by Josi Kilpack, English Trifle is my favourite so far! I’d recommend English Trifle (and the other books in the series as well) to anyone who loves a good mystery and enjoys great recipes!